Who doesn’t love a little Surf and Turf? Going out for a dinner like this can get very expensive. My local grocer had these lovely lobster tails on sale for $6.00 each and that is just the excuse I needed to make a nice dinner. I had previously purchased a large amount of grass fed organic beef from my local co-op so all I needed to do was take out some wonderful rib eye steaks out of my freezer. I made this for Valentines Day this year so I went “all out” for this one. I know that risotto isn’t exactly “carb friendly” but we all need our cheat days! I started by liberally seasoning the steaks with kosher salt and black pepper. Next I heated a pan and seared off the steaks on both sides, then put them in the oven to finish. 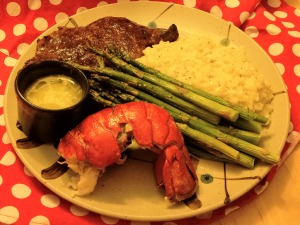 I decided to butter poach the lobster tails, so decadent and yummy. My favorite way to have asparagus is to roast it in the oven. It makes the outside a bit crunchy and the inside is tender and delicious. The risotto was kind of a cheat as it was an organic out of the box version from the co-op. Everything else was pretty labor intensive so I cut a corner there to have more time to enjoy the evening.